When looking for a quick dessert, I like turning to this Easy Ginger Pear Crostata. There are so many variations on it that I most often just purchase fresh bosc pears, a ready made pie crust and the rest is right out of the pantry and fridg. As stated in the recipe, this crostata serves 4-6 people but it is so delicious, you may want to make two. 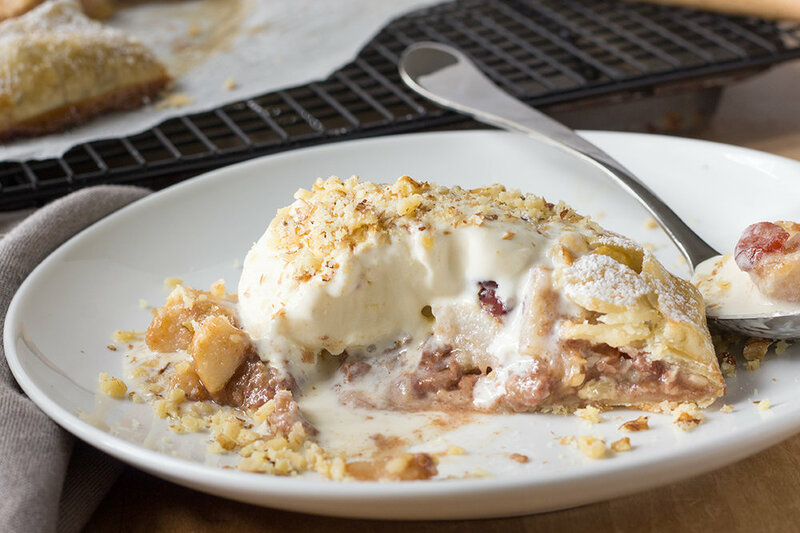 A crostata is always best when served with ice cream. Prepare the Pie Crust: Place the walnuts between sheets of parchment paper. Chop the walnuts. Roll out the pie crust on top of the parchment paper. Spread the walnuts over the pie crust up to but within 1 inch of the edge You do not need to press the walnut into the pie crust. Sprinkle the cinnamon over the walnut. Set the pan sheet aside. Complete the Filling: Over the chopped walnuts and cinnamon, spread the pear mixture. Set aside. Make the Topping: Dump the brown sugar into a medium-size bowl. Add the pinch of salt. Mash in the butter pieces a little at a time. Finish the crostata: Fold and turn about 1" of the pie crust over and all around the edge of the filling mixture. Thoroughly brush egg wash all over the exposed part of the pastry. Set the sheet pan on the middle-over shelf and bake for 30 to 40 minutes or until pie crust is a golden brown. Bosc and Anjou pears retain their shape and texture when baked. Thus, they are great options for tarts and pies. The difference between the two in tart is that the Anjou has a blander taste which may not stand up to the level of tartness in this recipe. The filling in this recipe is intentionally really tart. If you prefer a little less tartness, then of course reduce the juice and/or eliminate the zest. Just remember when served with ice cream, the sweetness from the topping and the ice cream offers a tasty balance to the tartness. Regarding the pie crust, you can of course make your own. I sometimes make pie crusts and freeze them for later use. In a pinch, however, when I do not have a pie crust in the freezer, I simply purchase a pre-made pie crust. To make the egg wash, mix together 1 whole egg with 1-3 teaspoons of water for a golden-brown finish. On Cook's Info, there is a great chart on choosing the right type of egg wash. The brown sugar and butter topping is almost similar to a crisp topping which includes oatmeal or flour. However, in this recipe because there is not flour to hold the brown sugar in the mixture, it tends to melt a bit down into the pears and over the walnut layer. Garnish with powdered sugar, if you choose to, after the crostata has cooled. However, much of the powdered sugar will still melt over the ginger pears. I sometimes add it simply to add a bit more sweetness to the pears and pie crust. Like the recipe? Let me know.